You are here: Home / Ethnic Groups / The People of Sulawesi / Who are the Bolango? Many believe the word Bolango is from the word balangon which means “sea.” The Bolango people are Gorontalo people who have wandered to an area in North Sulawesi province and intermarried with the Bolaang people who were native to that area. The resulting union between these two peoples also created a merger of languages and a mixing of cultures which resulted in something different than either the Bolaang or the Gorontalo originally had. Currently, the Bolango live in the border area between Gorontalo and North Sulawesi, in the regency of Bolaang Mongondow in the North Sulawesi province. This is about 3-4 hours east of the city of Gorontalo. The Bolango language is part of a larger language group called the Gorontalic family which also includes the Buol, Gorontalo, and Lolak languages. A typical cultural tradition is that people will greet each other as they pass on the street without stopping. They call this mogimbalu. Imbalu’ (greeting) is a sign of respect for the other person. They may or may not even know that person. This form of greeting is like saying “Good morning” or something similar. The Bolaang area used to be quite primitive. With the development of the Southern highway as an alternative route between North Sulawesi and Gorontalo, economic development has been stimulated. However, the road is not very busy and the bridges are damaged by flash flood. The income of the community has improved because of the opening of a fish processing plant in Bitung that handles the Bolaang tuna production. The Bolango people are majority Muslim. There has yet to be found a Bolango person who has embraced any other religion. 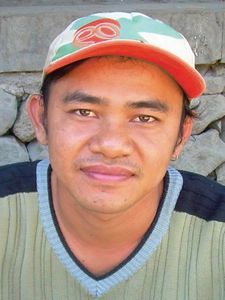 Not many non-Muslims live in the Bolango area, despite the fact that this group lives so close to the Minahasan people, who are mostly Christian. Illegal logging in the Bolango area is the cause of floods which damage bridges and roads due to the volume of sand, earth and stone carried by the flood waters. If illegal logging continues, the surrounding homes will be threatened as well. Because of this, community awareness of forest conservation is needed so reforestation can take place. This could open up a field of work that would form an integrated step toward meeting a need in this area.